The NVBR REALTOR® of the Year is selected annually from a pool of nominees. It is the Association’s highest honor and recognizes members for their civic, business and industry-related activities and achievements in the 12 months prior to award’s presentation. The award criteria upon which nominees are judged include service to the local community, business accomplishments, and service to the REALTOR® organization on the local, state and national levels. The NVBR REALTOR® of the Year is chosen by a selection committee. The winner is honored at the REALTORS® of Distinction Awards Gala, held each May. 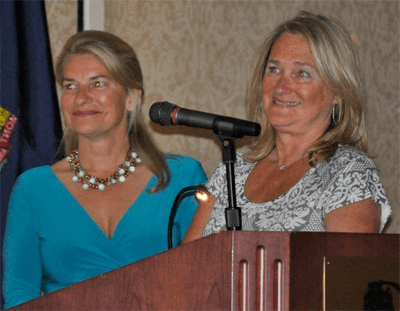 2011 NVBR REALTOR® of the Year recipient, Kathie Desautels, and 2012 NVBR REALTOR® of the Year recipient, Nancy Jenkins. 1971 Claude W. Perry, Sr.
1980 James F. McMullen, Jr.
1987 Calvin J. Ploof, Jr.